Something different for Jesse Terry this time. 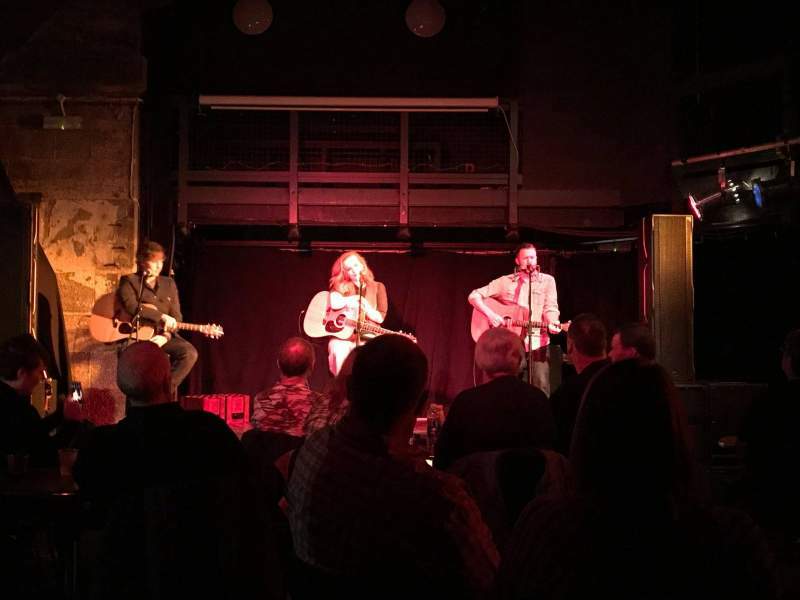 He’s teamed up with fellow singer-songwriters Michael Logen and Laura Oakes for a songwriters circle gig in the round at the intimate Cluny 2. Most of tonight’s audience are probably more familiar with Terry than his fellow performers as he’s played Newcastle on a regular basis over the last couple of years. Despite being somewhat less well-known to tonight’s audience Michael and Laura are well received and the show bursts with fine songs. Liverpudlian Oakes joined New Englander Jesse and Nashville’s Michael at a week’s notice to fill in for Lizanne Knott who had to pull out of the 14 date tour because of illness. Laura is a strong singer with an effective repertoire. Glitter is an upbeat slice of contemporary country whereas Nashville Stole Your Girl is more reflective and maybe a little autobiographical. Laura is a good fit for the show with her songs occupying the middle ground between the pop leanings of Jesse and Michael’s intensity. Terry, Logen and Oakes all take it in turns to chat about their songs and perform with one of the others adding an occasional harmony, or, in Michael’s case, tasty blues harmonica. The in-the-round format means nowhere to hide if the material isn’t up to it-which is not the case here. Logen’s songs are heart-wrenching and thoughtful with numbers like Human After All and Goodnight/Goodbye sounding like they’re taken directly from real-life. Jesse Terry’s four year stint as a full time songwriter in Nashville is evident. His songs are commercial and accessible and mainly pulled from the recent Stargazer album. The title track, Runaway Town and Dangerous Times (his assessment of the current state of the US) are all instantly catchy. Jesse does occasionally call on his own experiences for inspiration, as with the final song of the night. Empty Seat On A Plane which recounts how he met his wife Jess when he was working on a cruise ship. She had a seat pre-booked to fly back to her native Australia at the end of the cruise but at the last minute decided not to take it and stay with Terry instead. The merch table at the end of the night does good business with all three performers happy to chat and sign CDs. The whole evening had an informal, good-natured vibe to it, like you’ve popped round to a mates’ house and the guitars have come out.